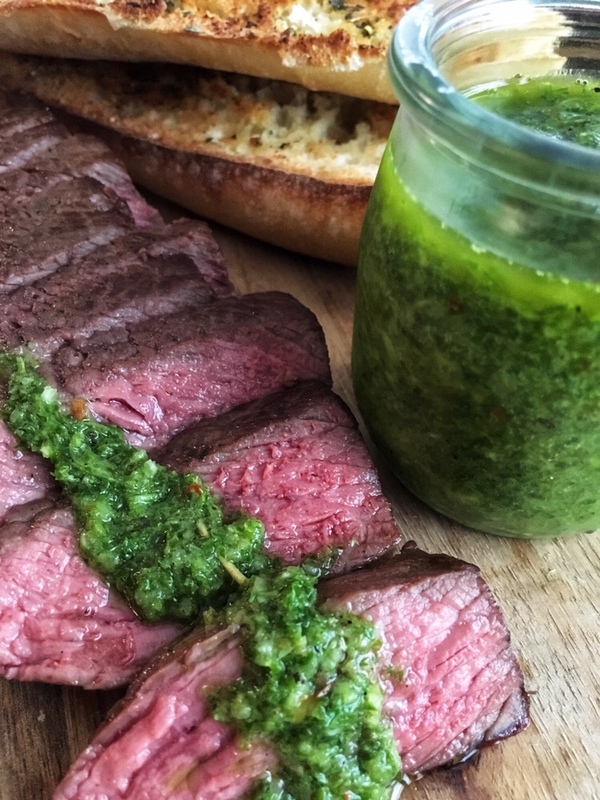 Garlicky and packed with flavour, this chimichurri sauce is a great way to use up parsley and perfect with steak and chicken. Who has an abundance of parsley they need to use up from their garden? With the recent cold we have experienced, I harvested a lot of parsley and was looking for ways to use it. Since we were having steak for dinner, my mind naturally went to a sauce that I could serve with it. As most of you know, I am all about the sauces and dips. All the condiments in my fridge are a testament to that. Chimichurri is always a great option with beef and easy to make in minutes. There are three cloves of garlic in this batch so perfect for anyone who loves garlic. It really does pack a punch. There’s a hint of spice with the red chili flakes but if you like things spicy, add as much as you desire. We loved this sauce so much, we were slathering it on bread and enjoying it. The kids loved it too, alternating between the chimichurri and the sesame steak sauce. Since this sauce was a hit, I ended up making more and just putting it in the freezer. Ready to go whenever we need it. Place the parsley, onions and spices in a food processor and blitz. Add olive oil and process until well combined.